This one has taken me AGES to pick up. It's now over 3 years since the Pelican 'March Into The Sea' 12" came out. 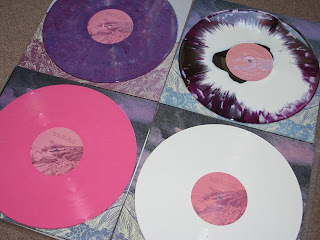 There were 4 colours of vinyl put out by Hydrahead, and their strict "one copy per person" ordering rule made it hard for nerds like me to get more than one. Back then I was REALLY into this band, so had a friend and my brother also place orders on my behalf. Which bagged me three of the four colours right off the bat. But by the time I found out about the record, the rarest version was already gone - the purple vinyl, which was the only version to come with a vellum overlay cover. I have watched many copies of this sell on eBay over the last couple of years. And the price just seemed to come down and down. When it first came out it was going for about $70 I think. But I stumbled across one on eBay UK with a buy it now price of £9.99... which is cheaper than you can get new releases these days. Now, anyone who likes Pelican and knows about records will know that this 12" was also repressed by another label on at least two different colours, which means that, in theory, I still "need" at least two copies of this. However, I'm not really bothered about those. Funny though... it's not like me to be satisfied and not want more. Maybe I'm falling ill or something?